On August 14–ahead of the 72nd anniversary of Korea’s liberation from Japanese colonial rule–Korean Americans across the United States rallied to demand the U.S. government stop war provocations against North Korea and start talks towards peace. Korean Americans and other anti-war peace activists in New York, Washington DC, and Los Angeles held coordinated protest actions in their respective regions. 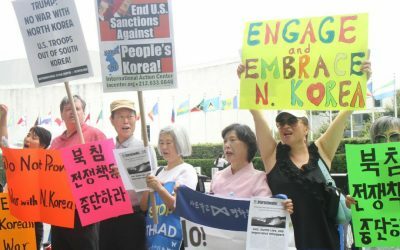 In New York, Korean American and other progressive peace activists protested outside the UN headquarters to protest UN sanctions against North Korea and demand the U.S. stop war-provoking military exercises. In Washington DC, Korean American activists gathered in front of the White House to call on the U.S. to take the path of peace talks over military action. In Los Angeles, 15 different peace groups rallied in Koreatown with drumming and a liberation dance performance. [The] on-going state of suspended war, in addition the decades of US-South Korea joint military exercises and threats of nuclear war have pushed North Korea to develop nuclear weapons and intercontinental ballistic missiles (ICBM)… We strongly urge the U.S. government to actively take the path toward dialogue and peace instead of continuing on the current path of sanctions and war. Such isolation — the end goal being regime collapse — is often put forth as the only possible option for dealing with a country the UN has described as guilty of crimes against humanity. But there are growing number of people, including diplomats and foreign policy experts, who say that US policy toward North Korea has simply not worked and that talks are the only way forward. The D.P.R.K.’s… offer of a freeze and the U.S. State Department’s recent offer to open dialog with the D.P.R.K., should it hold off on further testing of its nuclear weapons, indicates that there is will on both sides to pull back from the brink of war. That is sufficient ground for diplomacy to take root. Indeed, where other U.S. presidents have failed, you have the rare opportunity to succeed in achieving a durable peace with North Korea. On the heels of highly inflammatory threats being hurled back and forth between your administration and North Korea, the Ulchi Freedom Guardian war game, starting August 21, 2017, is fraught with danger. A miscalculation on either side could set us on an irreversible path to war, possibly nuclear war in which millions are projected to perish in the first hours of fighting, and which would turn much of the region into an uninhabitable nuclear wasteland. All images in this article are from Zoom in Korea.